New video from FlightTravels: Garuda Indonesia flight experience from Jakarta to Singapore, onboard PK-GNG, a Boeing 737-8U3 with Boeing Sky Interior cabin. Even with the gloomy weather at Jakarta, the flight experience was a very pleasant experience. Garuda Indonesia hospitality began at boarding with the cabin crew warmly welcoming passengers with a traditional clasped hands greeting. After ascending above the dark clouds, the view up above is very bright and welcoming. I decided on Indonesian style rice for my meal and it was a delicious choice. What a cultural bliss to be able to pair tasty Indonesian cuisine with a good Indonesian movie! During landing, I am happy to be treated to Singapore’s metropolitan cityscape. This entry was posted in Garuda Indonesia and tagged Boeing, Boeing Sky Interior cabin, flight experience, Garuda Indonesia, Jakarta, Singapore on March 22, 2015 by Bruce Drum. 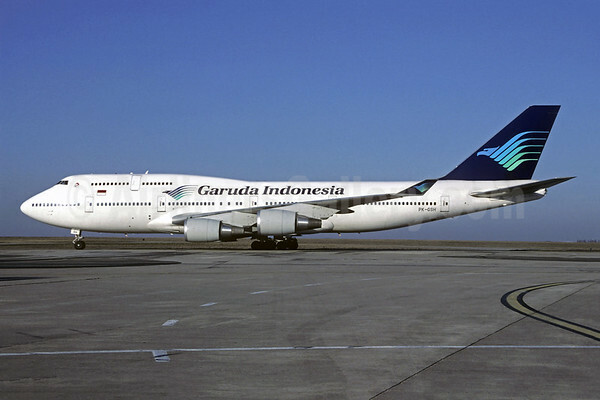 Garuda Indonesia‘s (Jakarta) Boeing 747-400 fleet has dwindled down to just two aircraft. 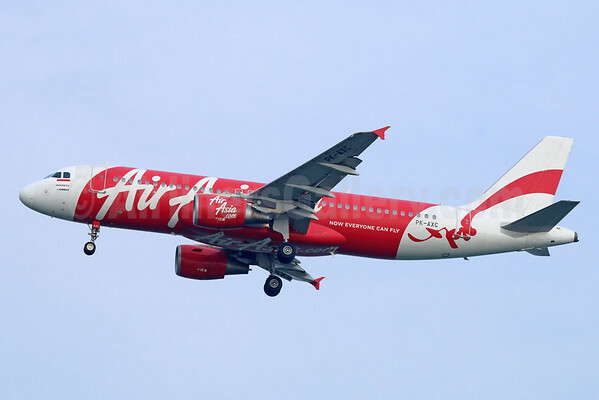 The airline has been using the aging type on mainly pilgrimage flights from Jakarta, Makassar and Medan, Indonesia to and from Jeddah, Saudi Arabia. According to Airline Route, the carrier will extend the life of the last two Jumbos until January 14, 2015 on the Jeddah-Jakarta route. Subject to another change, flight GA 9893 is likely to be the last revenue flight on this last route on January 14, 2015. Copyright Photo: Christian Volpati/AirlinersGallery.com. Boeing 747-4U3 PK-GSH (msn 25705) is pictured in the past at Paris (CDG) in the 1985 livery. This entry was posted in Garuda Indonesia and tagged 25705, 747, 747-400, 747-4U3, Boeing, Boeing 747, Boeing 747-400, CDG, Garuda Indonesia, Indonesia, Jakarta, Jeddah, Paris, PK-GSH on October 8, 2014 by Bruce Drum. Garuda Indonesia (Jakarta) on June 15, 2014 officially restored the Jakarta – Tokyo (Haneda) route to meet market demand and broaden its flight network. For Garuda Indonesia, the occasion signifies an important moment in history as its echoes the airline’s first flight from Indonesia to Japan on March 13, 1962 which departed from the old Kemayoran Airport in Jakarta for Haneda Airport in Tokyo via Hong Kong, using a Lockheed 188 Electra. The Jakarta – Haneda daily flight schedule departs from Jakarta at 13.05 (Local Time) and arrives in Haneda at 22.35 (Local Time). On the return flight, GA 875 departs from Haneda at 00.30 (Local Time) and arrives in Jakarta at 06.00 WIB. 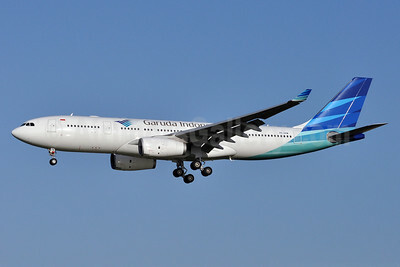 To serve the restored Jakarta-Haneda service, Garuda Indonesia operates the Airbus A330-300 on the route that features a two class layout; business class with a seat capacity of 36 passengers and economy class for 215 passengers. With the opening of the Jakarta – Haneda direct service, Garuda Indonesia currently serves 39 weekly flights to Japan, including the Jakarta – Osaka (Kansai), Denpasar – Osaka (Kansai), Jakarta – Tokyo (Narita), Denpasar – Tokyo (Narita), Denpasar – Tokyo (Haneda), and Jakarta – Tokyo (Haneda). Through the codeshare agreement with ANA-All Nippon Airways, Garuda Indonesia passengers will be able to fly with ANA to various large cities in Japan, such as Fukuoka, Saporro and Okinawa. In addition, the opening of the Jakarta – Haneda service will offer Garuda Indonesia passengers the choice to continue their journey to Los Angeles and Seattle/Tacoma with Garuda Indonesia and Delta Airlines codesharing flights. 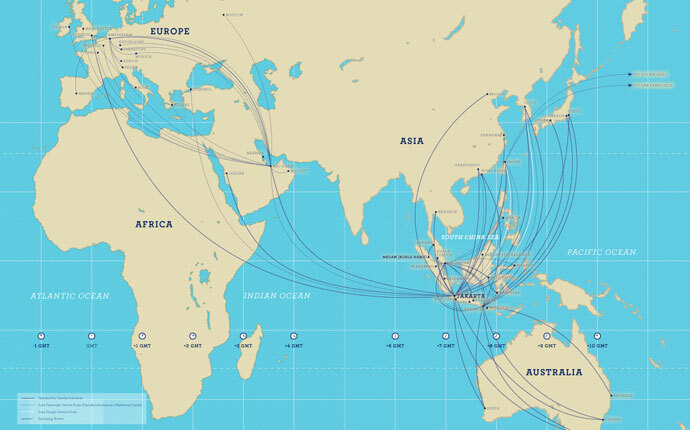 The launching of the Jakarta – Haneda direct service is part of the airline’s “network” expansion program, especially in the international sector, following Garuda Indonesia’s official entry into the “SkyTeam” global alliance. 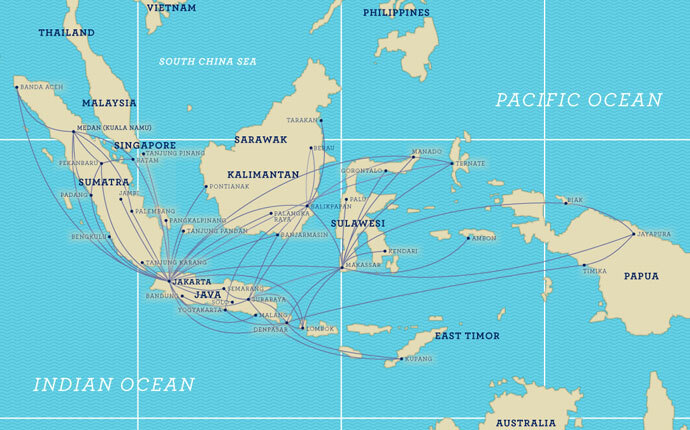 As a SkyTeam member, Garuda Indonesia can now expand its service network to 1,064 destination cities in 178 countries that are served by SkyTeam member airlines, which constitutes more than 90% of the world’s air traffic, with up to 15 thousand flights per day. 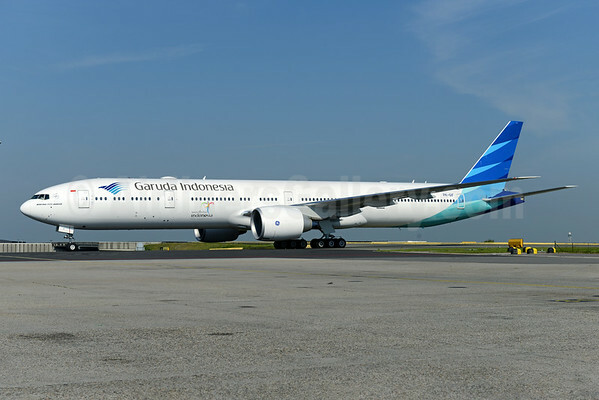 In line with Garuda Indonesia’s continuous expansion through the airline’s “Quantum Leap 2011-2015” long-term program, in 2014, Garuda Indonesia plans to purchase as many as 27 new airplanes, consisting of two Boeing 777-300s, four Airbus A330s, twelve Boeing 737-800s, three Bombardier CRJs, and six ATR 72-600s. Copyright Photo: Nik French/AirlinersGallery.com. Airbus A330-341 PK-GPD (msn 144) taxies across the tarmac at Tokyo’s Narita International Aport (NRT) in the special Liverpool Football Club “You’ll Never Walk Alone” color scheme. 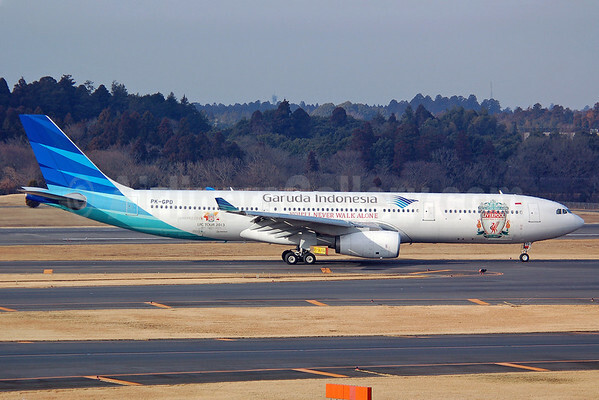 This entry was posted in Garuda Indonesia and tagged 144, A330, A330-300, A330-341, Airbus, Airbus A330, Airbus A330-300, Garuda Indonesia, Haneda, haneda airport, Indonesia, Jakarta, Liverpool Football Club, Narita, narita international airport, NRT, PK-GPD, Tokyo, Tokyo International Airport on June 16, 2014 by Bruce Drum. ANA (All Nippon Airways) (Tokyo) and Garuda Indonesia (Jakarta) have announced a comprehensive partnership under which the two airlines will code share on flights between the two countries and will allow passengers to be able to collect and redeem miles on Frequent Flyer Program of both airlines. From March 30, 2014, ANA will operate new route between Tokyo’s Haneda Airport and Jakarta Airport, followed by Garuda Indonesia opening the same route from the first quarter of 2014. These new flights will increase the number of weekly flights operated by the two carriers between Japan and Indonesia to 53 – comprising 14 ANA flights and 39 Garuda Indonesia flights. Both airlines will be providing improved and expanded customer service concurrent with this agreement and network expansion. 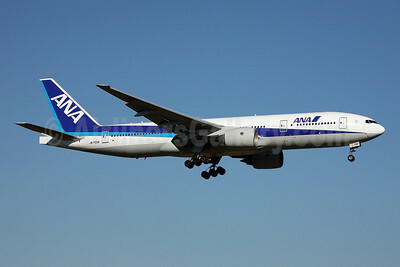 ANA and Garuda will allocate code share flight numbers to flights between Japan and Indonesia operated by each airline. Passengers on ANA flights arriving in Jakarta will be able to travel on to maximum of 10 Indonesian routes such as Jogjakarta or Denpasar on code share flights operated by Garuda Indonesia while passengers on Garuda Indonesia flights arriving at Haneda Airport, Narita Airport or Kansai International Airport will be able to travel on to maximum of 11 Japanese routes such as Chitose or Nagoya using code share flights operated by ANA. The two airlines will also start discussions on a partnership between their respective mileage programs. The details of joint mileage program, including the start date, will be announced separately on both companies’ websites when decided. Top Copyright Photo: John Adlard/AirlinersGallery.com. ANA’s Boeing 777-281 JA702A (msn 27033) arrives in Fukuoka. Bottom Copyright Photo: Tony Storck/AirlinersGallery.com. Airbus A330-243 PK-GPM (msn 1214) of Garuda Indonesia approaches Amsterdam for landing. This entry was posted in ANA-All Nippon Airways, Garuda Indonesia and tagged 1214, 27033, 777, 777-200, 777-281, A330, A330-200, A330-243, Airbus, Airbus A330, Airbus A330-200, AMS, Amsterdam, ANA, ANA-All Nippon Airways, Boeing, Boeing 777, Boeing 777-200, FUK, Fukuoka, Garuda Indonesia, haneda airport, JA702A, Jakarta, PK-GPM, tokyo haneda on December 29, 2013 by Bruce Drum.